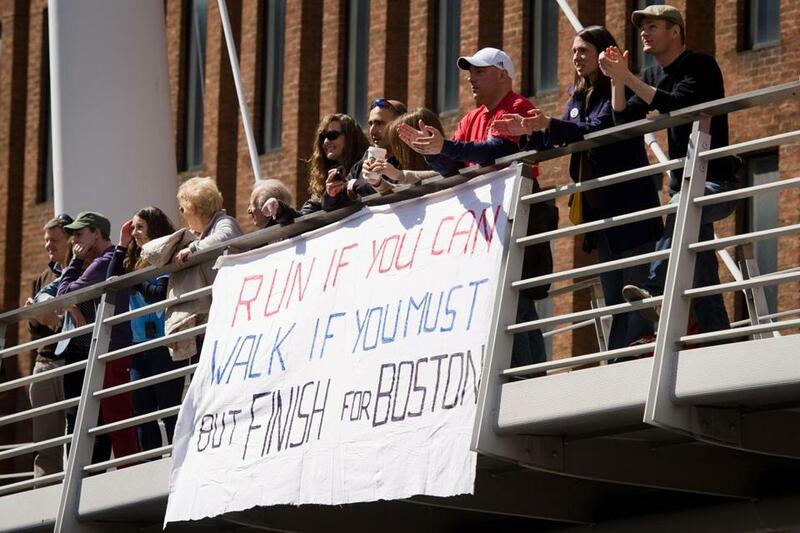 Spectators in London stand behind a banner showing support for the victims of the Boston Marathon bombings. LONDON — Moments after finishing the London Marathon, Harry Neynens struggled with his emotions. He started to describe crossing the finish line Sunday amid cheering crowds, then stopped. He needed a moment to collect his thoughts, to choke back tears. He started his story again. This time, the narrative began back on Boylston Street in Boston. For Neynens, the 2013 London Marathon and 2013 Boston Marathon always will be linked. A week ago, Neynens, who lives in Enfield, Nova Scotia, waited on Boylston Street for his wife, Colleen, to finish Boston. Colleen spotted Harry in the crowd at the 26-mile mark, ran over, and kissed her husband. Then Harry walked down Boylston Street to catch up with Colleen once she crossed the line. She finished as 4 hours 7 minutes 12 seconds flashed on the race clock. He found himself 100 yards away from the bomb explosions and he saw some of the critically injured victims. “I had a hard day out here,” said Neynens, who wore a 2013 Boston Marathon hat during his London run and finished in 2:48:09. “I was hurting, but obviously I was not hurting near as much as the injuries that I saw, people who lost their legs. I finished for all those people who were hurt and those people who couldn’t finish last Monday. Sunday was a perfect day for a marathon. And it stayed that way as more than 36,000 runners completed 26.2 miles. From the Greenwich Park start to the Mall finish in front of Buckingham Palace, runners and spectators kept Boston in their thoughts. In the starting area, a pair of runners held up a red and white banner that simply read: “For Boston.” As enthusiastic, undeterred spectators awaited runners at Tower Bridge, along the River Thames and in the shadow of Big Ben, that seemed a sentiment shared throughout London. The perfect marathon day quickly turned into a tribute to Boston’s strength and a celebration of the human spirit. That message came through, too, as the massive field raced under sunny skies with early temperatures in the mid-40s, ideal weather identical to what runners enjoyed in Hopkinton almost a week ago. The sunny day seemed to encourage larger-than-usual crowds along the course, according to several runners who previously participated in the London Marathon. Estimates put the crowd at 700,000. Given the large numbers, spectators appeared undaunted by the Boston terrorist attack and determined to experience the whole marathon spectacle. They cheered the efforts of everyone from men’s champion Tsegaye Kebede of Ethiopia (2:06:04) and women’s champion of Priscah Jeptoo of Kenya (2:20:15) to the back-of-the-pack charity runners. “Go Boston!” was a popular refrain when runners wearing a Boston hat or T-shirt passed by. On a business trip to Africa with a stopover in London, Ted Hammett decided to join the crowds along the marathon route. It’s been long week for the Watertown resident. He supported Boston runners last Monday from the 20-mile mark. Hammett said he lives about a half-mile from where the Thursday night shootout took place and about a half-mile from where authorities captured the second bombing suspect, Dzhokhar Tsarnaev. Early Sunday afternoon, Hammett stepped out of the Monument subway station wearing his jacket from the 100th Boston Marathon and a Red Sox hat. He wanted to show some Boston pride. There was visibly increased security along the course, especially in popular viewing spots like the areas around Tower Bridge and the Houses of Parliament. Metropolitan Police officers in neon yellow jackets looked closely at spectators and their bags. It was rare to walk more than 50 feet without seeing a pair of officers. Policemen also stayed vigilant just inside London Underground stations near the route. And it was equally easy to spot sniffer dogs near the same stations and around the finish area. At Horse Guards Parade, essentially at the back door of the prime minister’s 10 Downing Street residence, there was a particularly heavy police presence as runners reunited with family and friends in the area. The approach to the actual finish line was a secured zone that required special credentials and a bag check. Prince Harry was among the spectators welcomed into the finish area, demonstrating the city’s high level of confidence in race security. Prince Harry told reporters he never considered cancelling his medal presentation appearance. In marked contrast to Boston and Boylston Street, the London finish takes place on a wide boulevard flanked by Green Park and St. James’s Park and always heavily guarded royal residences St. James’s Palace and Clarence House. The buildings are set back a considerable distance from the roadway, making it easier to create a secure zone that covers the last 200 meters of the race. Still, crowds were thick and well-patrolled just before the London Marathon’s final stretch. That approach to the finish was the fastest part of the marathon for Norman Ritchie. Throughout the race, when he would see runners in Boston shirts, Ritchie, of Houston, would slow down and talk about last Monday. He ran Boston this year. At Mile 25 in London, Ritchie changed back into his 2013 Boston Marathon finisher’s shirt and ran his quickest mile.